In the death metal music scene internationally, there’s plenty of festivals for the discerning death metal fan from which to choose. 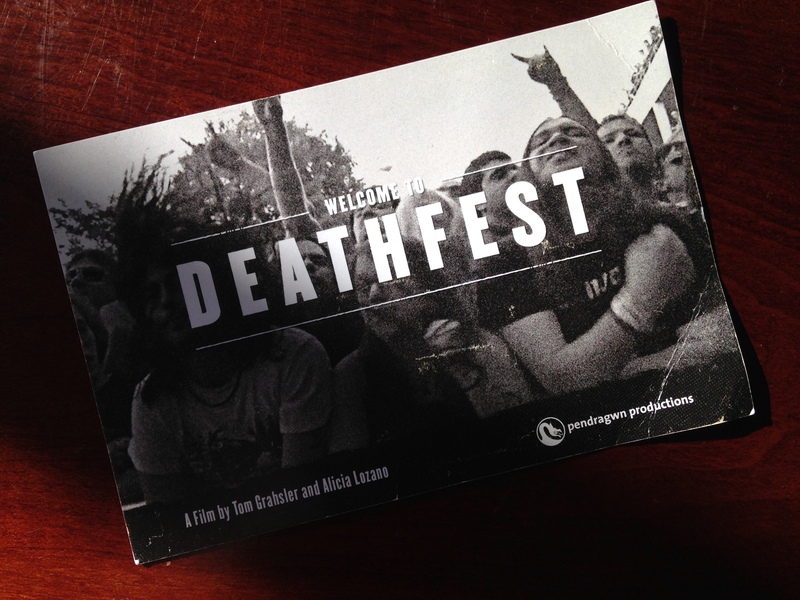 One of the highly regarded annual events is Maryland Deathfest, or MDF, which has been the subject of a trilogy of Woodstock-style documentaries (on which your humble editor worked, from Handshake, Inc.). There’s a new documentary on the scene created by a different crew of people, however, called Welcome to Deathfest. They (Pendragwn Productions) filmed at MDF XI in Baltimore, Maryland, 2013. The filmmakers are in the middle of spreading the word about the film—at least two of the crew can be seen at large metal concerts around the Baltimore/D.C. Metro area passing out flyers for the film—and getting it screened. They premiered it in 2014 on May 9th at the Maryland Film Festival in Baltimore. “This is my favorite question!” said Tom. “The majority of the film was shot on the HPX series of Panasonic cameras. It was shot on P2—the HPX 500 was used for all of our sit-down interviews and basically anything with a lock off. It’s a bit of a monster to carry around in the heat for 13 hours a day, so for the concert footage and the roving camera stuff we shot on the HPX 120. “This year, we went back to MDF and did some follow-up interviews with Ryan [Taylor] and Evan [Harting, the two MDF organizers] that might eventually make it into a different cut of the film. That stuff was shot on our new Black Magic Cinema camera. That camera uses prime lenses, so for our beauty shots of the festival we used that, and we switched back to the HPX 170 for any roaming/concert footage again. Check out clips from the film at the Welcome to Deathfest website. This entry was posted in Interviews and tagged Baltimore, death metal, Maryland Deathfest, Welcome to Deathfest by Editor. Bookmark the permalink.